Omar El Masri commenced his PhD at TJI in September 2016, and is looking at the emergence of urban street art spaces which challenge existing pervasive and spatial arrangements of neoliberal and ethnonational ideologies in the post-conflict cities of Beirut and Belfast. Prior to pursuing his PhD, Omar completed his MPhil in Conflict Resolution and Reconciliation at Trinity College Dublin's Irish School of Ecumenics program in Belfast in August 2016, where he spatialized existing urban street art in Belfast's Cathedral and Smithfield-Union quarters as both subversive to and a tactic of resistance to neoliberal spatializations in the city centre. 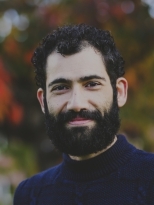 As a native of Beirut, Omar has a Bachelor of Arts in Political Science from the American University of Beirut and a Bachelor of Science in Economics from the Lebanese American University and recently moved to Belfast from Washington, DC in 2015.